It is time to replace the venerable "invisible hand" of Adam Smith with something new and more suited to the strange and challenging nature of digital products. Think instead of an "invisible handshake," that draws producers and consumers into a more cooperative, balanced, and productive relationship. It takes a handshake, because digital is a post-scarcity economics. What matters here is not a balance of demand and finite supply over a population of producers and consumers in a single market -- but a compatible understanding of value between individual pairs of producers and consumers who can act without that producer constraint. Let's indulge in some armchair economics to explore some big-picture ideas derived from previous posts. This draws especially on the prior post -- about my thought experiment of an all-knowing economic demon, that leads to the idea of an invisible handshake, as replacing the invisible hand. I suggest a kinder, gentler kind of scarcity. Some scarcity is unavoidable, so our solution is not the extreme peer-to-peer "economics of abundance" that some now advocate -- with its limited ability to motivate and sustain serious production of value. The solution is to re-imagine the socio-economic contract between consumers and the producers that create value for them, to ensure a business model for producers. To maximize the value produced, and the entrepreneurial creativity, we need to motivate organizations that are selfishly driven by a desire for profit. I suggest a new kind of market that rewards the production of intangible stuff, based on a this new socio-economic contract -- neither the limited motivational power of pure altruism, nor the deadweight loss of artificial scarcity. And I suggest that this new economy can evolve from where we are, starting now, with the FairPay architecture outlined in this blog. The beauty of the Smith's invisible hand is that it set prices in a way that worked not only at a micro level, but also as a basis for an allocation of resources for society at large. The whole edifice of market economics has been based upon this. But now the digital world creates strange new rules, at least in that special portion of our markets. So then, for the digital domain, what now? We now have freemium and other new models, but do they have any real economic rationale? Do they tell us how to allocate resources in a way that is good and efficient for individual producers and consumers, and across society? Many producers have rely on some form of artificial scarcity as a way to sustain revenues, but put the accent on artificial -- this has no fundamental basis, and creates no balance or fairness in resource allocation, "The inefficiency associated with artificial scarcity is formally known as a deadweight loss" (Wikipedia article on artificial scarcity), This may help keep producers solvent, but is fundamentally very hit or miss. We also have the sharing economy, that recognizes digital abundance with its emphasis on collaboration and open-source, but with questions of efficiency, effectiveness, and sustainability at scale. The core challenge of the economics of real goods and services is the allocation of limited resources: physical resources, labor, and capital. As Adam Smith said in 1776 in The Wealth of Nations, "...price...is regulated by the proportion between the quantity...brought to market, and the demand of those...willing to pay...." Smith went on to describe how "...he intends only his own gain, and he is in this, as in many other cases, led by an invisible hand to promote an end which was no part of his intention. ...By pursuing his own interest he frequently promotes that of the society more effectually than when he really intends to promote it." So in the face of scarcity across a market, prices are set by the invisible hand to allocate the supply where it is most wanted. Hayek expanded on Smith to argue that an economy needs prices as the only effective way to signal how resources should be allocated. Debate on how well this works for society continues, but it is widely recognized that it works to build wealth. Is there something to replace that in the digital world? I propose doing allocation in digital markets with an invisible handshake, because the game changes without scarcity of supply. What matters is no longer a dance of a market as a whole at a given point in time, but a dance of each consumer with each producer over time. So what should determine price? Each producer can provide as much as is desired by each consumer. There is no inherent supply constraint -- all that matters is whether the compensation from that consumer satisfies that producer. Prices for different consumers need not bear any relationship. What does it matter if some pay more and some pay less? Maybe that depends on how much they want to use, what value they get, and how able they are to pay. We are conditioned to think price discrimination is unfair (and sometimes illegal), but that is true only when unilaterally enforced by excess producer power, not if done for reasons acceptable to consumers. The new allocation is not one of supply, but of share of wallet. If each consumer deals with a market full of suppliers for all of their digital products and services, the relevant scarcity is of their wallet -- how much can I spend on all of my digital desires, and how do I split that among my providers? If I negotiate over time, in "dialogs about value," to share the economic surplus of my digital purchases, I am forced to allocate my spending within some digital budget, across all of my suppliers. I can do that any way I wish (to the extent that each supplier agrees to permit). 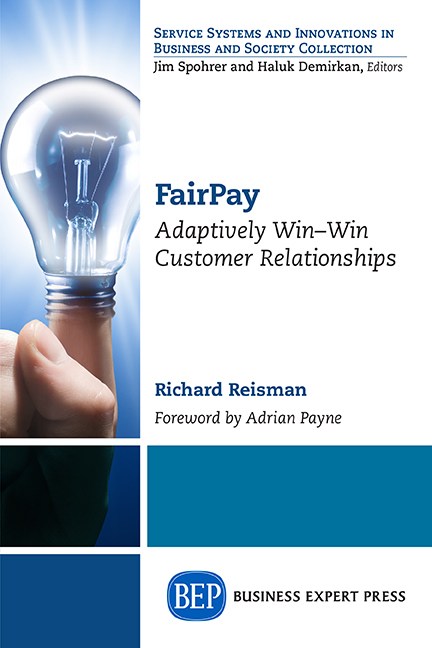 If all consumers do that, then all suppliers get their fair share of all of the wallets for all of their consumers. They sell as much as their aggregate market population desires, at a sum of prices that is the maximum each market particpant is comfortable allocating. So, like the invisible hand, the invisible handshakes between each of the individual pairs leads indirectly to a socially beneficial allocation. Like the invisible hand, it refers to an emergent process that by seeking local solutions, leads to globally optimal solutions. 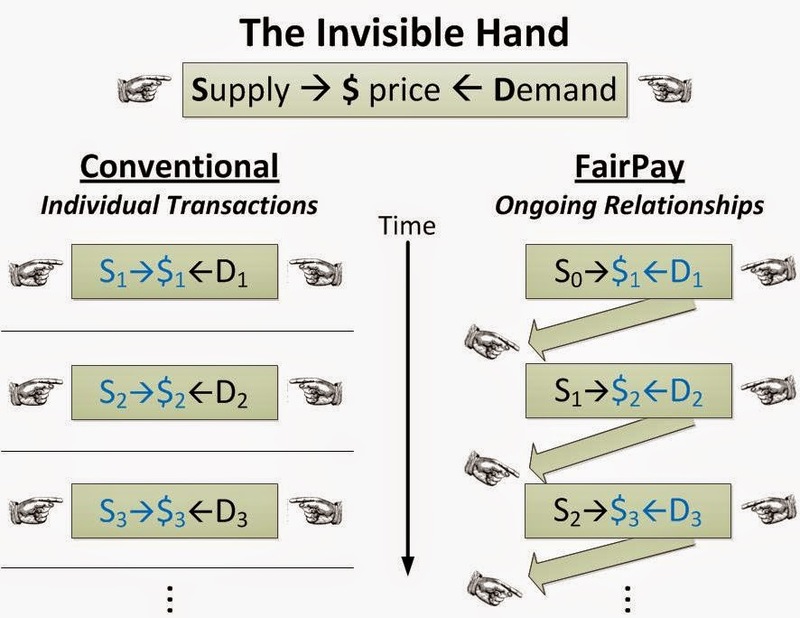 The invisible hand applies external market-wide forces (supply vs. demand) to producers and consumers at a given point in time (actually a short interval), It pushes them together to a market price. That pricing process indirectly leads to an approximately optimal distribution of scarce supply resources. 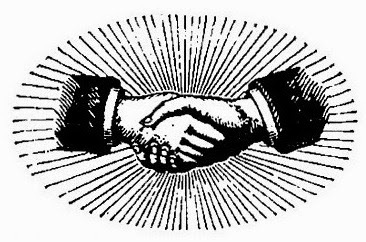 The invisible handshake is driven by an agreement between individual consumers and producers to seek a mutually beneficial relationship. That binds them in an emergent process that generates prices over the course of the relationship, and indirectly allocates the wallet share of each participating consumer to demand as much digital wealth as each is willing to pay for -- at prices that work for each of them individually -- to compensate producers for producing as much as each one -- and thus the total population -- values. Digital products and services can be instrumented to generate detailed usage data that correlates to the actual value received. Both parties participate in ongoing dialogs about value, which add subjective insight, but still can be partially validated by the usage data. Based on these dialogs, the producer extends pricing "credit" to the consumer. If the consumer abuses this credit, they get less credit, and lose some or all of the ongoing privileges of the handshake. 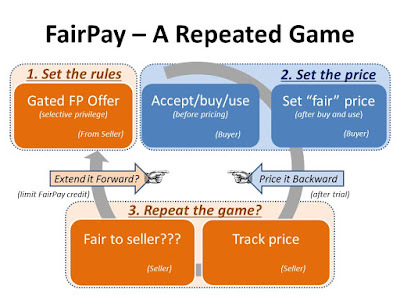 This process generates consumer reputation ratings for fairness with each producer. Since a good reputation rating has benefits (much like a credit rating), consumers will seek to maintain it. This provides the basis for a post-scarcity economy, at least for digital -- and perhaps more broadly. The digital goods and services are not scarce, but the willingness of consumers to sustain producers is scarce. The invisible handshake governs an allocation of that willingness to sustain. To/from each consumer according to his willingness and ability to pay. To/from each producer according to their ability to create realized and recognized value. As noted in the prior post, this handshake enables a kind of first degree price discrimination. Conventional economics views first degree price discrimination as economically efficient, but not feasible. But what emerges from the handshake is a new kind of first degree price discrimination that is feasible and agreed to by each consumer. This enables a broader sense of economic value than is generally addressable in conventional markets. 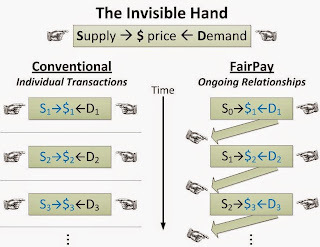 The invisible hand allocates supply and demand for particular items at particular times, thus narrowing consideration, in ways that ignore sustainability and other aspects of social value ("externalities"). Many have sought to broaden the focus of producers with notions of "Creating Shared Value" (CSV) and triple or quadruple bottom lines, that factor in financial, environmental, and social (and other) dimensions. 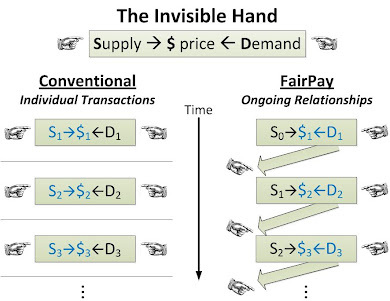 The invisible handshake creates prices that reflect not just financial value, but whatever dimensions of social value the producer-consumer pair want to reflect in the dialogs about value. There is no need for added bottom lines, or separate CSV objectives -- CSV is integral to the handshake. It is the lack of past and future that create many of the problems in conventional market economics. We balance supply and demand in the short term, with no direct way to factor in long-term consequences for the individual parties, or society as a whole. Addressing those "externalities" by bolting on special measures (taxes, subsidies, etc.) is artificial and very problematic. With the invisible handshake, the whole focus is on a relationship over time. Value shares may fluctuate in the short term, but move toward a desirable sharing over the life of the relationship. Sustainability can factor in directly. Instead of trying to find a price, we need to find a broader kind of agreement. Instead of agreeing on price. we price out of agreement. That agreement will naturally vary from person to person and from time to time. The effect of this "invisible handshake" is to draw producers and consumers into a more cooperative, balanced, and productive relationship. Moving from here to there will take learning and adjustment by all market participants. But digital has already shattered the market for content to bits -- shouldn't we take advantage of this opportunity? *There is of course the important case of ad-supported digital services that take no share of wallet. It seems clear that this is not sufficient to support all digital services but it will remain an important contributor. The handshake process can factor in the value of ad viewing as one part of the compensation that offsets any monetary price, and thus takes less share of wallet. In fact, any aspect of value (attention paid to ads, personal information made available for sale, referrals, etc.) can be factored in as credits into these dialogs about value. **Of course conventional set prices (or any pricing scheme at all) will also effect some kind of allocation of wallet. But is there any economically sound rationale? -- it is arbitrary, crude, and not personalized (as the pricing demon would suggest), and thus results in significant deadweight losses (notably the value not provided to those who would benefit from and pay fairly for it). In Search Digital Marketing posts knows how to provide sales opportunities certain without bogus guarantees. I used to be really blessed to get referred by a buddy that found In Search Digital Marketing for his or her organization. My business has generated fantastic leads and my web site is fantastic also. In Search Digital Marketing can it all for my business from social websites submit, blog sites, Search engine optimization?